Want the opportunity to help your local K-8 school win up to $30,000 toward extracurricular activities and educational programs? Encourage your school’s administrators, teachers or PTA president to participate in the second annual Scholar Dollars Grant Program. 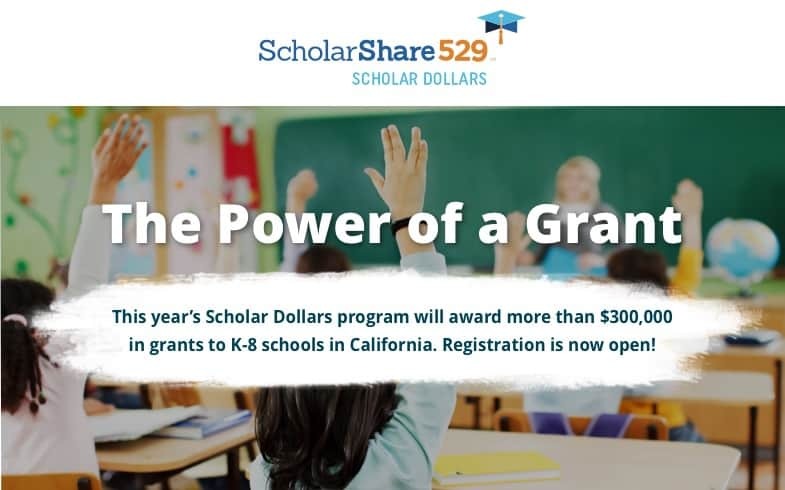 Administered by California State Treasurer John Chiang and ScholarShare 529, California’s 529 college savings plan, the innovative grant program will award 20 grants, ranging from $5,000 to $30,000 each, depending on school size, to K-8 public and charter schools in California to help support extracurricular and afterschool programs. Schools can spend their grants on musical instruments, computers, library books, gardening tools or sports equipment, or fund enrichment programs like tutoring labs, student counseling, science and technology instruction, and many other activities. In the program’s first year alone, 20 winning schools have used the grant to purchase 80 new Chromebooks, send a classroom of 5th-graders to science camp, build a running track and more. “This grant has helped Nobel go a long way towards meeting our goal of ensuring that all students have access to a computer to increase computer literacy, research skills and create products that have real world implications,” said Felicia Drew, Assistant Principal at Alfred B. Nobel Charter Middle School, one of the 2017 Scholar Dollars Grant Program winners. Eligible K-8 schools can register online at MyScholarDollars.com starting 8:00 a.m. PST on February 15, 2018, through 8:00 p.m. PST on March 7, 2018.